Students from the College of Imaging Arts and Sciences will showcase their inventive 360 immersive video projects for visitors at Imagine RIT: Innovation and Creativity Festival on Saturday. Students from the College of Imaging Arts and Sciences will showcase their inventive 360 immersive video projects for visitors to Imagine RIT: Innovation and Creativity Festival this Saturday, and also provide the means for attendees to view them on their own devices and even take them home. 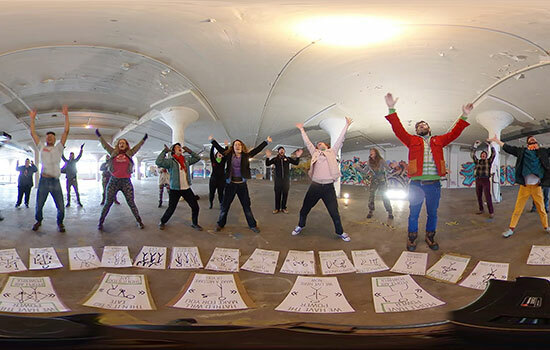 The “Experiments in 360 Storytelling” exhibit is an offshoot of a course developed last year by Josh Thorson, an assistant professor of fine art and 4D design coordinator in the college’s School of Photographic Arts and Sciences. He’s teaching the class for the first time this semester. According to Thorson, projects vary from a 360 video documenting a protest performance after the 2016 election to an all-women ROC City Roller Derby team and RIT’s Baja SAE Racing team, among a number of others. Also known as immersive videos or spherical videos, 360 videos are video recordings where a view in every direction is recorded at the same time, shot using an omnidirectional camera or a collection of cameras. During playback, the viewer has control of the viewing direction like a panorama. It also can be played on displays or projectors arranged in a cylinder or some part of a sphere. At Imagine RIT, Thorson said the videos presented inside Gannett Hall will enable visitors to experience them through a 360 headset, see them a TV monitor and a number of laptops on hand. Festivalgoers also will receive a QR code for each video to view on their own devices or take home with them. The projects have included developing innovative narrative strategies within immersive environments, developing projects from ideation to pre-production to final product, technological problem-solving for 360 video and audio capture, and the insertion of 2D and 3D graphic content into these environments. “The course is grounded in concepts and histories of perspective within the visual culture,” he added. “And those who are new to the experience will enjoy exploring the possibilities for this new way of experiencing narratives in 360 degrees,” he concluded.